1. What is the Masoretic Text (MT) ? The original Old Testament Hebrew was written, using only the consonants without vowels or accents. Scribes and scholars were appointed to put in the vowels and accents. They are known as Masoretes. The OT they produced is known as the Masoretic Text. The Masoretes began their work in the 7th century and successive Masoretes managed to finish it in the 11th century. Within the Masoretic Text there are different families (eg. Ben Asher, Ben Napthali etc). 2. What is the difference between a Text and a Manuscript? A manuscript is a handwritten copy of another manuscript without making any changes. A Text is a compilation of several manuscripts. It inevitably involves making changes when two manuscripts differ. The Scribe would need to decide which word is in the original. This process is known as Textual Criticism. The MT is a text, not a manuscript. MT is the result of Textual Criticism. Both the Ben Chayyim Text (the primary OT Hebrew text underlying the KJV) and the Textus Receptus are the products of Textual Criticism. 3. What are the available manuscripts of the MT? There are thousands of OT Hebrew manuscripts. Below is a list of some important MT manuscripts. 4. Are the MT manuscripts identical? No two manuscripts are completely the same. Nevertheless it must be noted that the differences are very small. 5. It is true that the Dead Sea Scrolls are the same as the MT? The Dead Sea Scrolls are pre-Masoretic. Masoretes only appeared in the about the 7th A.D., whereas the Dead Sea Scrolls belongs to the B.C. era. The texts of the Dead Sea Scrolls can be divided into 3 categories: i. A Text that is close to the MT. ii. A Text that is close to the Septuagint (LXX). iii. A Text that is close to the Samaritan Pentateuch. 6. Did the New Testament writers use the MT exclusively? The answer is no! The New Testament writers made use of the Septuagint (Greek translation of the OT). This is noted by the KJV translators and is mentioned in the Preface of the 1611 edition. The Masoretic Text in Exodus 1:5 reads “seventy souls,” whereas the LXX reads “seventy five souls.” Luke in the book of Acts follows the LXX and has it as “seventy five” in Acts 7:14. In Psalm 8:6 the KJV translators opted to follow the LXX instead of the Ben Chayyim Text. For thou hast made him a little lower than the angels (מאלהים mi'ĕlôhîym God), and hast crowned him with glory and honour (KJV). The author of the book of Hebrew also chose to quote from the LXX and has the word “angels” instead of elohim which is the Hebrew word for God. In Gen 15:6 the KJV translators rendered it exactly as what the Hebrew says. And he believed in the LORD; and he counted it to him for righteousness (KJV). Note that in James 2:23 and Romans 4:3, both James and Paul quoted form the LXX which has the word “God” instead of the word “LORD”. The KJV translators are aware that the Apostles not only did not condemn the LXX, but chose to quote from it. See what the KJV translators say in the Preface of KJV 1611 edition. The translation of the Seventy dissenteth from the Original in many places, neither doth it come near it, for perspicuity, gravity, majesty; yet which of the Apostles did condemn it? Condemn it? Nay, they used it, . . . The NT inspired Authors show an acceptance of LXX. This attitude is completely different from the KJV-only camp. This is an example we should follow with regard to translations which use other OT texts or manuscripts. The attitude of the KJV-only camp contradicts the position held by the Apostles. The use of the LXX by the NT inspired authors also debunks the KJV-VPP theory. 7. Which MT did the KJV translators use? The OT Text used by the KJV translators is the Ben Chayyim Text, printed by Daniel Bomberg in Venice in 1524-1525. It belongs to the MT tradition. This Ben Chayyim Text has been identified by the KJV-VPP proponents as OT text underlying the KJV (The Burning Bush 2007, Vol. 13, no. 2, pp. 79, 97). 8. How did the Ben Chayyim Text come about? The Ban Chayyim Text, also known as the Second Rabbinic Bible is an improvement of the First Rabbinic Bible (1516-1517). It is based on some late manuscripts. As a text it also went through the process of textual criticism whenever the manuscripts differed from one another. 9. Did the KJV translators believe the MT or the Ben Chayyim Text underlying the KJV was perfect or exactly the same as the Autograph? Were they guided by the Holy Spirit to make all the correct decisions regarding textual matters, resulting in a perfect MT that is free from error? The answer is a definite no! They did not believe that the text underlying the KJV was perfect. Neither did they create a new MT. If they did, they would have mentioned it in the Preface of the 1611 editions. These are the reasons why we believe the KJV translators did not believe in a Perfect OT Text or Apograph. a. The KJV translators never claimed that the OT or NT text they used was Prefect. b. The KJV translators provided numerous marginal notes where they chose not to follow the Hebrew word for word. They frequently used dynamic equivalence in their translation. The passage above is taken from Job chapters 11 & 12 (KJV 1611 edition). Note that the literal translation of the Hebrew is in the margin. In this short section there are 3 incidents of dynamic equivalence. a. The preface of the 1611 KJV edition indicated that the translators were uncertain in some areas and were open to the view of the Septaugint (LXX). This section is taken from Judges 19:2-5. The translators were not certain whether it should be a year and four months or just four months. b. The translators provided alternate readings on the side margin of the 1611 editions for the wise to make their own judgments. In fact they objected to sticking to one reading when they are uncertain. This is further proof that they do not believe the MT used by them was perfect. c. The translators defended their decisions to include marginal notes where there are uncertainties. Some peradventure would have no variety of senses to be set in the margin, lest the authority of the Scriptures for deciding of controversies by the show of uncertainty should somewhat be shaken. But we hold their judgment not to be so sound in this point. (Preface of the KJV 1611). d. The later editions of the KJV made changes to the 1611 editions including changes in words, numbers, gender and tenses and not just spelling. The changes do affect the meaning of the text (See Appendix i). They also raise the question about the perfection of the text underlying the KJV, since the KJV 1769 edition differs from the KJV 1611 edition. 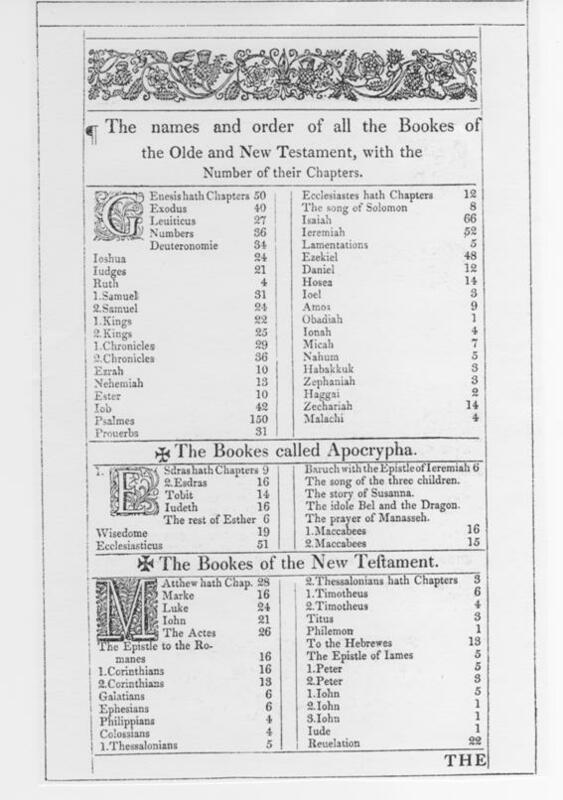 e. There were 14 extra books of the Apocryphal added in the 1611 edition. It has 80 books in total. The claim that the Holy Spirit guided the KJV translators to make all right textual decision and there is no error in the text underlying the KJV cannot be true. How could the Holy Spirit guide the KJV translators to add 14 extra books which He did not inspire? Please see the content page of KJV 1611 edition. This is a reproduction of the content page of KJV 1611 edition. The 7 points above make it clear that the KJV translators did not believe that the Holy Spirit guided them in all textual matters so as to be free from error. How could the Holy Spirit guide the translators to add 14 extra books to the Old Testament? If there were a perfect apograph believed by the KJV translators they would have mentioned it in their preface. If they had created a new MT they would have made it known to the public. 10. Did the KJV translators follow the MT or the Ben Chayyim Text completely? The answer is no! There are verses where the KJV translators chose not to follow the MT in favor of the Latin Vulgate, Septuagint, and others. Yes! There are many verses where the KJV translators chose to disagree with the MT. Isaiah 19:10 is one such example, where the translators took an entire verse from the Latin Vulgate. NKJ Isaiah 19:10 And its foundations will be broken. All who make wages will be troubled of soul. KJV Isaiah 19:10 And they shall be broken in the purposes thereof, all that make sluices and ponds for fish. In this verse the KJV translators deliberately chose to depart from the MT or Ben Chayyim Text entirely, and follow the Latin Vulgate whereas the New King James remained true to the MT. The word “fish” in Isaiah 19:10 comes from the word “Picses” from the Latin Vulgate. The marginal notes show that the translators knew the Hebrew word, but preferred the reading of the Latin Vulgate over the Ben Chayyim Text. Look at the chart below. There are many verses where the departure from the MT is justifiable, but there are also many cases where the departure to favor the Vulgate, Targum, or Septuagint is not justifiable. In either ways the notion of a Perfect MT underlying the KJV is impossible. No translators who hold to the view that the MT or Ben Chayyim Text is perfect will ever choose to deviate from the MT in so many instances. A single departure will render perfection impossible. For a detailed list where KJV translators chose to ignore the MT please read King James Onlyism: A New Sect (pgs. 563-590). There are at least 200 departures from the Ben Chayyim text. There are too many departures to explain away. It is obvious that the KJV translators did not regard the MT as perfect. Neither did they believe in a perfect text underlying the KJV. The KJV translators would never consciously and deliberately choose to depart from the MT or Ben Chayyim Text if they had believed it to be perfect. There is absolutely no ground for the KJV-VPP people to claim that the text underlying the KJV is perfect. KJV-VPP proponents should stop putting words into the KJV translators’ mouths. 11.Are there scribal errors in the MT? Yes, there are, but they can be easily corrected by internal evidence. The two accounts in Kings and Chronicles will help track any scribal errors and correct them. Look at the example below. a. How old was Jehoiachin when he became king? 2 Chronicles 36:8 says that Jehoiachin became king at the age of 8. He reigned for 3 months and did evil in the sight of the LORD. I was amazed that a child at the age of 8 could be so wicked. 2 Kings 24 said that he became king at the age of 18, and reigned for 3 months and 10 days. Jehoiachin cannot be king and reign for 3 months at the age of 8 and 18 at the same time. Either the age in 2 Kings is the right age or the one in 2 Chronicles. Both cannot be correct at the same time. It is likely that the answer is 18. God gave us two separate accounts in Kings and Chronicles. By comparison scribal errors can be identified. 2 Samuel 21:8 states that king David took 5 sons of Michal, the daughter of Saul, and gave them to the Gibeonites to be hanged. First, Michal is childless so she could not have given birth to 5 sons. Second, the husband is identified as Ariel who is actually the husband of Merab. The conclusion is that the scribe must have mistaken Michal for Merab. See the verses below. 12. Do we have the total content of the inspired OT Autograph today? We believe the entire inspired Word of the Autograph is embedded in the manuscripts. By the use of external evidence (comparing various manuscripts and ancient translations) and internal evidence (eg. comparing Kings and Chronicles) we might finally arrive at the Perfect text, but without the inspired Autograph to compare with we cannot make such a claim. We can at best make a speculative statement, but we have no right to condemn other texts that differ, because the content of the Autograph is in the multitude of manuscripts, not one. The KJV translators did not believe that the OT Masoretic Text or the Ben Chayyim Text underlying the KJV was perfect. They did not follow the MT totally and chose to depart from it wherever they deemed fit. The numerous deviations from the MT by the translators make the claim that the text underlying the KJV is perfect untenable. The differences between the 1611 and the 1769 editions of the KJV also make it impossible for the KJV to be perfect either. The preface and marginal notes of the 1611 KJV translators clearly indicate that they do not accept either the text underlying the KJV or the Translation itself to be perfect. No MT can live up to the claim of perfection. A single error will render the claim false. God could have preserved a perfect text in a single manuscript somewhere, but it cannot be the Ben Chayyim Text or the Text underlying the KJV. We believe that that God has preserved the entire Bible in the multitude of the manuscripts. It is wrong to take a text or a translation that cannot live up to the standard of perfection and insist that it is perfect. It is worse to use it to condemn those who differ or to split the Church of God. Doing so is sinful. Matt 12:23 Is this the son of David? Is not this the son of David? *for details please read King James Onlyism, A New Sect by Dr James D. Price. Ellis R. Brotzman, Old Testament Textual Criticism (Grand Rapids: Baker, 1994), 56. Ernst Wurthwein, The Text of the Old Testament (Grand Rapids: Eerdmans, 1979), 12.